A nine-year-old boy uses his special powers to borrow other people's memories to carry out a series of hazardous missions. Spies and secret agents took 1960s TV by storm. The Man from UNCLE (US, 1964-68), I Spy (US, 1965-68), Get Smart (US, 1965-70), Danger Man (ITV, 1964-69) and others filled the TV schedules with various forms of espionage. But among the men and muscle was a sleuth with a difference - he was just nine years old. His name was Joe McClaine, but for security purposes he went by the secret designation Joe 90. Joe 90 was the brainchild of Gerry and Sylvia Anderson , the husband and wife team behind Stingray (ITV, 1964-65) and Thunderbirds (ITV, 1965-66) and, like these, was a puppet show. 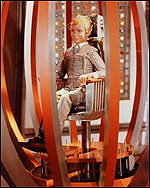 Unlike its predecessors, however, Joe 90 attempted to trade more heavily on its characters rather than all-out action. This helped to address some of the problems of its immediate predecessor, Captain Scarlet and the Mysterons (ITV, 1967-68), which was criticised for weak characterisation. After 10 years of making puppet series, however, the basic format was starting to lose its sparkle. As Gerry Anderson later admitted, "Joe 90 lacked some of the lustre of the earlier shows." In the first episode, 'Most Special Agent' , Joe's adoptive father 'Mac' McClaine unveils a new process which enables him to covertly copy and store brain-waves. These can then be transferred to a third party, enabling the new host to acquire 'another person's skills and memories. The machine at the heart of the process, the BIGRAT (Brain Impulse Galvanascope Record And Transfer), is demonstrated on young Joe, with the approval of Shane Weston, supreme commander of the World Intelligence Network (WIN). Weston immediately realises the potential of Mac's invention and wants to use the BIGRAT in the battle against terrorists and foreign operatives. He also wants Joe as the recipient of the copied brain patterns, an idea initially dismissed by Mac. But when Weston explains the benefits via an imaginary scenario (involving Joe stealing a top secret fighter aircraft), Mac relents - Joe can become Special Agent 90. Despite Gerry Anderson 's misgivings about the series, Joe 90 has much to recommend it, including a first class musical score, composed and arranged by long-term collaborator Barry Gray . It also benefits from some strong scripts, but these were not enough to breath life back into the Andersons ' puppet franchise. Their next major TV production, UFO (ITV, 1971-72), would be live action.